In January 2017, Tempur-Sealy International introduced its restructuring of the Sealy product portfolio. The three lines of 2015-2016 – Sealy brand, Posturepedic, and Optimum – are discontinued. In their place are three others – Response Line, Conform Line, and Hybrid Line. The Response Line consists of innerspring mattresses. Memory foam mattresses are in the Conform Line. And members of the Hybrid Line are hybrids. The 2015-2016 models are still available as close-out items. The new products will become more visible as older ones are sold out. Sealy’s new Conform Line has eight models in three collections: Sealy Essentials, Sealy Performance, and Sealy Premium. The three collections have models from each of the lines. Response Line has 31 models (5 in Essentials, 17 in Performance, 9 in Premium). The Hybrid Line is to be released in 2018. Currently, the Conform Essentials Collection has three models: Optimistic Plush (11.5″ high), Treat Cushion Firm (10.5″), and Upbeat Firm (9.5″). The Perfomance Collection has Fondness Cushion Firm (11.5″), High Spirits Firm (10.5″), and Thrilled Plush (12.5″). Models in this collection and the Premium Collection feature Sealy’s Posturepedic Technology, which has extra support (in this line, denser foam) in the middle third of the mattress, under most of the body weight. The two Premium Collection models are Gratifying Firm (12.5″) and Wondrous Ultra Plush (13.5″). Prices for Essentials mattresses begin at $449.00. Performance models begin at $979.00, and those in Premium at $1,829.00. 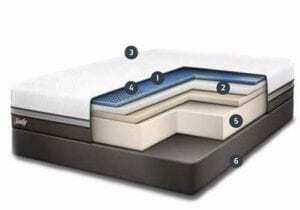 Premium mattresses have four layers each. One Performance model (Thrilled) has four layers, and the other two have three. In the Essentials Collection, Optimistic and Treat have three layers each, and Upbeat two. 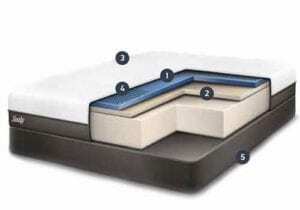 Like the former Sealy Optimum brand, mattresses in the new Conform Line feature top-to-bottom gel, with foams in each layer, including the support base, infused with gel. Outlast, the temperature-regulating phase change material, is no longer named as such. Premium Collection mattresses have Chill™ Cooling Technology (CCT) in the cover and in the top layer of gel memory foam. Those in the Performance Collection have MoistureProtect™ in the quilted cover and CCT in the top memory foam. Essentials mattresses have neither. There are no details given on the Sealy website explaining what the Chill™ Cooling Technology (CCT) is and how it works, but this technology is used in the Chill model of the online mattress Cocoon by Sealy. The Cocoon Chill page does describe it somewhat. It is a phase change material. It is Sealy‘s trade term for Outlast (It may be an newer version – the version used in 2016 was OutlastGold). It is used in the quilted covers of the Premium models, as well as in or on the Sealy Chill™ Gel Memory Foam in the Premium and Performance mattresses. In the Cocoon Chill, it is in the cover. While CCT regulates temperature by how it changes its physical state to absorb or release heat, MoistureProtect™ regulates moisture by wicking it and transporting it to where it can evaporate. This also contributes to temperature control, since warmth stimulates perspiration, and evaporation cools. It is notable that Sealy no longer claims cooling as a benefit of gel. The effectiveness of gel for cooling has been questioned by several mattress experts, including Dr. Rick Swartzburg, David Rosenberg, and the Savvy Rest blog writer, Laura. The reason is that gel can absorb only so much heat, and when it has reached its limit it actually becomes too warm. The ineffectiveness of gel for cooling is reflected in the evaluation of Sealy Optimum mattresses by Sleep Like the Dead. They gave that line D+ for “No heat retention” because of the percentage of users complaining about being too warm. As to cooling, the most consistent means has been airflow. This is best achieved by ventilating the comfort foam(s) vertically, and the top surface of the base support foam horizontally, as in the Airflow Transfer System, which is demonstrated in this video. Though it is not stated in the text, the banner image for the Conform Line indicates that the top foam layer is ventilated. Sealy has a 10-year warranty on all its mattresses. The sleep trial or return period depends on the retailer. It is too early to see how customers will rate mattresses in the new Sealy Conform Line. Retailers, such as US-Mattress and Sleep Outfitters, list the company’s claimed “Comfort Scale” for each model so the customer knows what to expect. It appears that they are looking for an owner satisfaction rate higher than the 76% for Optimum.